While glancing at available free agents in my West Coast fantasy league this week, I noticed David Carr’s name at the top of the point list. Any time you see Carr leading a category of anything other than “most sacks” or “most times a QB looked like he might cry on the sidelines,” it’s a little jarring. But since we have 10 teams and 18 rosters spots apiece, you wouldn’t call it incredible or anything. Look at those last three guys! Are you kidding me? The list became more and more amazing as I scrolled down. 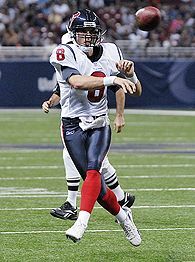 Jon Kitna was eighth. Chad Pennington was 10th. Brian Westbrook and Frank Gore were the only non-QBs in the top 20. The Bears’ defense had as many points as LaDainian Tomlinson. I could go on and on. and nobody’s on pace for 300 this year. I’m not even sure you could call it an aberration that will rectify itself over the course of the season. Other than Tomlinson, is there a back that makes you feel, “Wow, I’m totally set with this guy”? Didn’t think so. Plus, only 12 points separate the No. 11 RB (Willis McGahee at 46) from the No. 26 RB (Tiki Barber at 34). It’s a swollen middle class, with a tiny upper class and a humongous lower class. And it’s really not that fun. 2. The tight end position has become as useful as a sideline reporter or an appendix. Nobody has more than 34 points total. Ridiculous. Which reminds me, we’re about two weeks from me making the first “Where are they holding the funeral for Antonio Gates’ fantasy career?” joke. Just warning you now. 3. The QB position (always dismissed as overrated for fantasy purposes) is making a major comeback: Five QBs are averaging 20-plus points this season (McNabb, Frye, Grossman and the Mannings) and three others (Carr, Pennington and Leftwich) are damn close, and we haven’t even mentioned the old standbys (Brady, Palmer, Delhomme and Bulger) yet. If you aren’t getting big points from your QB spot, I guarantee you aren’t doing well in your league right now. By the way, zero QBs averaged 20 points a game last season. On Sunday at 6:00 p.m., ESPN Classic is showing a movie that never, ever, EVER gets shown on TV: “The Jericho Mile.” Not only was this Michael Mann’s first movie, it’s one of the 10 greatest sports movies of all time. You need to watch it. I mean, we could be looking at a situation here where (A) the Bears’ D doubles the fantasy points of every other defense except the Ravens’, and (B) it could be a top-20 fantasy “entity” (for lack of a better word) after everything’s said and done. In my league last season, the highest defense had 122 points. The Bears are on pace for 200 right now. Crazy. 5. Four white receivers (Mike Furrey, Drew Bennett, Wes Welker and Matt Jones) have more fantasy points than Randy Moss. Actually, Furrey has nearly three times as many points as Moss: 34 to 13. That’s why he has replaced Kurt Warner as the pride of the Arena Football League. 6. I hate playing the “he’s on pace” gimmick because we all know things even out over the course of a season. To some degree, anyway. But Rams kicker Jeff Wilkins is on pace for 60 field goals and 20 PATs right now, and if you’ve watched St. Louis’ end zone struggles at all — take it from someone who watches every Rams game now — you know these final numbers are absolutely conceivable. Sixty field goals in one season! This number is actually in play! 7. 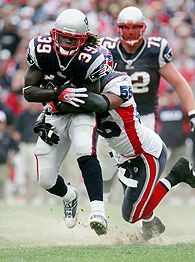 Not only do rookies Laurence Maroney (52), Joe Addai (37) and Maurice Jones-Drew (30) have more points than Reggie Bush (29), but you wouldn’t be able to trade him for any of those guys, and there’s a decent chance Jerious Norwood and DeAngelo Williams could pass him in the next few weeks. You know the guy in your league who took him five rounds too early? You can officially start busting his balls. 8. The top 12 in everyone’s draft featured four potential lemons: LaMont Jordan (stuck in a fantasy quagmire in Oakland); Ronnie Brown (being slaughtered by the Culpeppocalypse); Cadillac Williams (has a first-rounder ever landed on a fantasy waiver wire when he’s been healthy? ); and Steve Smith (I still don’t trust those hammies). And that’s before we get to Bush, Chambers, Moss, T.O., Lewis, Droughns, Delhomme and everyone else. 9. There’s no way to corroborate this, but we’re probably on pace to break the record for “most cheap fantasy points at the end of already-decided games,” highlighted by Marques Colston’s spread-busting 86-yard TD in the final 90 seconds of the Carolina game (a mortal lock for the “Alcoa’s Greatest Gambling Moments” 2006 wrap-up show on ESPN6). I mean, why even spend the money on a fantasy magazine in August anymore? What’s the point? These guys never even hint about emerging until the last two weeks of the exhibition season or unless they were suddenly traded somewhere else, right? Let’s all agree to stop buying magazines. Waste of money. Reality A: There’s either a 9-in-10 chance or an 11-in-12 chance that you’re going to lose your league, depending how deep it is. Reality B: Thanks to platoons, free-agent movement, injuries, unpredictable rookies, bad luck and everything else, fantasy football has turned into a freaking crapshoot. Nowadays, anyone has a chance. Take my buddy Camp, the original commissioner of my East Coast League before he got married, had a couple of kids and stepped down. OK, we fired him for negligence. Now he’s one of Those Guys in our league — the guy who starts players during their bye weeks, waits four weeks to waive someone who’s out for the year and offers crazy trades like “Wes Welker for Laurence Maroney.” He’s also one of the funniest owners (the master of inappropriate mom/sister jokes); he laughs at everyone else’s jokes on the annual conference call; his team name is high comedy (a college joke I can’t print), and his teams have the bizarre ability to remain annually competitive even though he’s two to three guys short every week. The pluses always outweigh the minuses with Camper, even after you get bounced from the final playoff spot because he accidentally started a running back with a blown ACL against the guy who ended up beating you out. Well, Camper’s 2006 team includes Tomlinson, Eli Manning, Tatum Bell, Antonio Bryant, Stallworth and Anquan Boldin. Did we make fun of him for taking Bell, Bryant and Stallworth too early? Yes. Yes, we did. Does he even know who half these guys are? It’s unclear. But here’s something I do know: His team whupped my team in Week 2. That’s right, Camper’s a contender this season. And when he waived Jake Plummer before Week 3 and picked up David Carr, it was destiny. Yup, Camper is going to win our league title; David Carr will help lead the way; and all of this makes sense because this is fantasy football and nothing makes sense anymore. Note to Jeff Fisher: The next time you decide to give a rookie QB his first start (against a good defense, no less), could you please announce it before I hand in my Friday picks? A little “heads up” would be nice. Thanks. By the way, get ready to see Dom Rhodes on your league’s waiver wire in about three weeks. Addai looked great against the Jets; you could see him getting better as the game went on. He’s about two weeks from getting a Chris Berman nickname like Joseph “Live and Let” Addai, which works perfectly because that song came out in 1974.